I really liked the redesign that Pat Broderick gave to Captain Atom's costume when DC brought the Charlton heroes into the DCU. It's simple and effective - you just know the guy is powerful by looking at him. There have been a few attempts to redesign his look since, but that always looked a little busy to me and didn't really work. He looked great in animation as well, always a good test of a costumes effectiveness. I'm compelled to agree with you, Ross. Maybe it's a form of jadedness. But, while I loved the Charlton-era stories, I thought the good captain's Silver Age look was one of the few instances where Steve Ditko had artistically failed. For me, the best test of how well a costume works is live action. If a movie/TV costumer, or at least a cosplayer, can make it look right, then you've got a winner. These put the costume on an actual human frame and shows what the other characters would actually see. I did a quick image search (via Bing) for Captain Atom cosplayers, and the ones I found need some tips on SFX makeup; they all have single-tone looks, making them appear (literally) two-dimensional. Otherwise I think they at least have a good Proof of Concept: it works. With the turn-around in status of innocence in recent covers, maybe one cover could have Magnus, Robot Fighter being charged with destroying human-minded robot bodies from Nextlyfe(? ), a division(?) of Cogwell's Cogs from "the Jetsons" (2017). Nice on Ross. 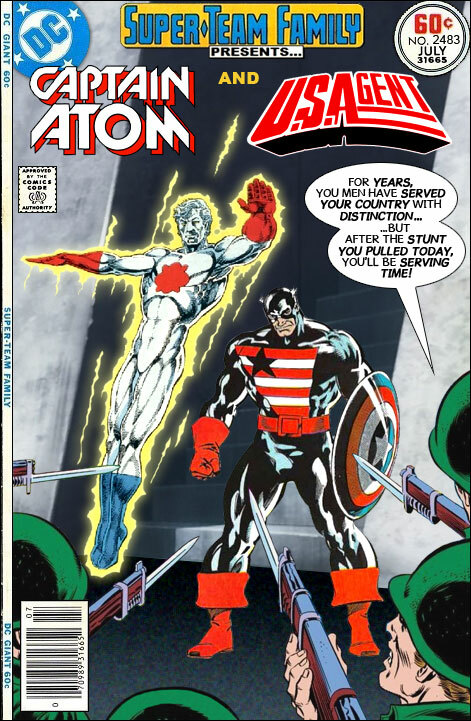 With this cover in mind, how about a team up with US Agent and Agent Liberty? Nice idea here; but I can see this leading to a new team of patriotic /military heroes. Capt. Atom, US Agent, Deathstroke, Liberty Belle (Jesse that is) Agent Liberty, Uncle Sam, for starters. Any thoughts? For Cav's suggestion, I'd hope that the team might include American Maid. Simon Williams(Marvel West Coast Avengers) knows stunts, let him be the judge. If we are thinking red jacket Wonder Man, how about a team up with Blue Devil as they go against Mysterio and Clay Face in...Set for Destruction! Would you also include that one who fought for truth, justice and the American way (at least on radio)? Or is he more of a hero and less of a "patriotic hero"? P.S. What about adding the All-American and Slugger? @Tim: you forgot Stunt Master and the Golden Age Stunt Man (who is now public domain)! Oh! Almost forgot; the Golden Age Black Cat, from Harvey Comics, was secretly stuntwoman Linda Turner. So, she'd qualify, too! All of these on-screen heroes (actors and stunt people) together need a name. How about The Cast of Heroes? I favor Mysterio as their first villain. @Jay: for all I know, he could have been the man behind the mask of the (non-genetically mutated) Human Fly! At least, if that short-lived 1970's comic had lasted a little longer, that might have wound up the illustrated case. Sounds like you guys have the makings of another interesting team of Hollywood-ish heroes w/ a couple bad guys brought in maybe for their skills. I think I've a name; the Blockbusters. Wonderman, Blue Devil, the Human-Fly, the Stunt Master, the original Black Cat, the 1st Clayface, Mystero. I can already 'see' an origin of maybe Clayface or the Black Cat learning something in Hollywood/ the film industry is wrong or theres a dark force and only those who truly are linked to the town whether good or bad can stop it. Just some food for thought. "They banded together to keep the Dream Factory from becoming one big nightmare. Coming soon, to a theater near you..."
Blockbuster Please be kind & rewind.